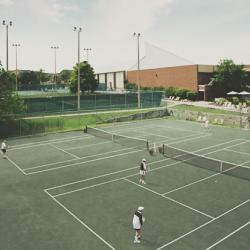 With a total of 20 courts, the Richmond Hill Country Club is a world class tennis facility. Tennis and Racquet Sports members enjoy a great club atmosphere with both indoor and outdoor courts, and all the amenities like fitness centre, sports cafe, pools and more! Forgiving on all joints, these soft courts will produce a lower bounce protecting against upper body fatigue and injury as well as lower body damage from harsh impacts. For players whose preference is a faster pace, higher bounce court. These courts are re-conditioned each spring to provide members a surface that plays like new for the entire season. Get the latest selection of racquets, shoes, apparel and more from all the top brands, right beside our indoor courts! Tennis members also have access to the Tennis Kenesis Program, providing tennis specific movement training. This traditional fitness favourite is played on well lit international courts with birch floating floors and professionally finished interior walls, air-conditioned and properly acclimatized for your comfort. Lessons for both beginners and experienced players are offered, and equipment is available at the Pro Shop. Program and lesson participants receive an assessment for the tennis staff to determine the appropriate group lesson or class. The assessment is used to place each player in our Rating-Ranking System, which helps members set up matches with players of their own skill level, and participate in club events. Our premier tennis supplement. Team Play Gold is a comprehensive tennis membership program designed to offer new members the complete tennis club experience. Members receive performance and fitness assessments, a dedicated ‘Team Play Coach’, access to sport specific fitness, competitive and social events, Rating-Ranking System and more! Annual events include Doubles, Outdoor Championships, Summer Pro-Am Challenge, Fall Team Tennis, and more! Using our Rating-Ranking system, players of all levels can enjoy a fun and competitive experience at all of our tennis events. The club staff is committed to helping you achieve your goals through a high standard of academic integrity in all of its tennis programs. Programs are designed to assess, train and tune every aspect of your game. Our tennis pros work with our fitness specialists to increase the efficiency and synchronization of your movements, thereby, enhancing your ability to play a better game. Win with confidence. Enjoy the inside edge. Just like the pros, take advantage of a roster of coaches tending to all parts of your game. Our diverse specialists work in harmony to systematically examine, train and tune every aspect of your game so consistently play at peak performance. As a team, we’ll surpass your expectations, and your opponent. The Richmond Hill Country club is proud to be the premiere facility in Canada to offer the combination of Tennis training with a tennis-specific KINESIS, Movement by Design conditioning program. Working with our performance team of trainers, coaches, fitness instructors and kinesiologist, we will enhance every aspect of your game. The primary focus of on court training will develop your game and strategy – we target your game’s development on proven tactical concepts and focus your attention on the fun details of the game – playing to win! A key component in all aspects of movement – we target your stabilizing muscle groups. This is rarely achieved through traditional strength training. The largest limiting factor in terms of Tennis Execution- we target your ability to train safely with the benefit of a full range of motion. The necessary component for competitive tennis – we target your ability to generate the appropriate amount of power to play the game with agility training, strength training and plyometrics. The essential component of your game – We can show you how to take your best shot from the start to the end of your game. 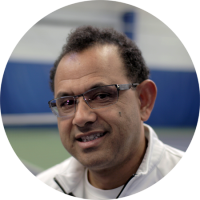 Richard has served as Director of Tennis since 1993 and has over 35 years of tennis coaching and teaching experience. He has provided RHCC with a world class tennis program since 1987 and is proud to have to worked with some of Canada’s best. He enjoys the challenge working with all members and assisting his staff to meet the needs of levels of players. Miron was a top Canadian junior, consistently ranked top 5 in Canada. In 2008 Miron began coaching at RHCC and in 2010 he was awarded The Gary Caron National Scholarship Award in 2012, assessed to the top Under 30 coach in Canada. 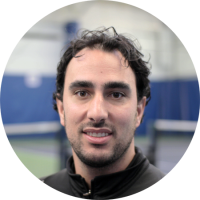 Miron is also a certified Level 3 coach with experience as a Team Ontario Provincial Coach, and as a Tennis Canada Mentor Coach. 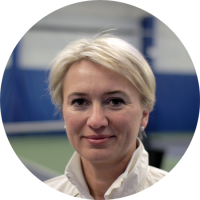 Aleksandra Zinko is formerly nationally ranked as a top 3 junior in Ukraine, Aleksandra also has a Master of Sports and 20 years of teaching experience. 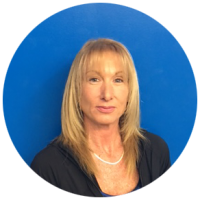 She enjoys teaching all levels and is ready to help you with all your tennis needs. 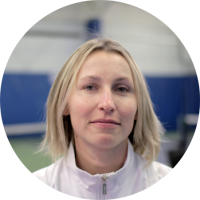 Marina Chulak has over 15 years of coaching experience. Prior to the start of the coaching career she competed as a junior player at the highest levels. Marina’s coaching philosophy is that tennis should be fun, energetic and played by everyone no matter the age or skill level. 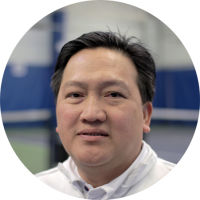 With over 25 years of tennis coaching experience, Gerry has served over 16 years as a lead coach at RHCC. He is a certified Pro 1 with the Tennis Professional Registry. Gerry enjoys working with all levels of players and has tremendous experience in teaching different levels including beginners through to advanced, and national champions. 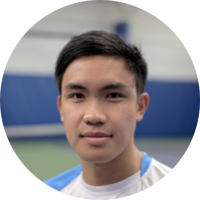 Gino’s tennis career spans over 17 years including 4 Ontario Provincial Titles in Singles and Doubles, being ranked as high as 3rd in Canada (singles) in Junior Division and participation in both National and International Tennis Events. He is a dynamic young coach who enjoys working with all levels. Born in Sochi, Russia and ranked as high to Number 7 in the former USSR with both singles and doubles national titles. Since immigrating to Canada 1991 he has worked with top Canadians and other nationally ranked players. He is dedicated to teaching tennis to all levels. Michal brings a love of the game and over 30 years of coaching experience. 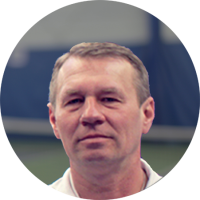 Michal is certified with Tennis Canada and has been part of the Toronto tennis landscape for many years. Michal spent the last 9 years coaching at Timberlane Athletic Club. Michal joined the Richmond Hill Coaching team in January of 2016. Designed and suitable for all levels of interest, abilities, and ages. The program includes professional tennis coaching, instruction, physical development-fitness and nutritional hot lunches along with snacks served daily on tennis patio or lounge. Parents seeking more variety of program activities for a full day can choose from a menu packed with options, which include a golf program, multi-sports camps, arts & crafts and general-day camp. Our goal is provide excellence in our junior tennis coaching programs along with providing exceptional facilities for players of all ages and abilities. Firstly, we wish to help fulfill the tennis goals as well as meet each players potential, including achievement at the highest level in the sport. Our programs are designed to include a wide range of player ability and player objectives. If you are looking to hit the ball, improve your technique, or meet new players with a similar interest then developmental recreational tennis is for you. As well, our highly trained staff can coach and guide you along if you are serious about long term development and competitive tennis. As comprehensive development program, Richmond Hill Country Club has received recognition as a national and provincial level program. The program offers a tremendous access to significant U.S. universities, recruiters and coaches. Richmond Hill Country Club Tennis Academy offers training linked to various tennis programs, including Ontario Tennis Association sponsored programs including the Provincial Team Regroupings, NTC National Programs, Mini Tennis and Progressive Tennis Programs for all levels. In addition our coaches have passed and received coaching certification of the highest levels from the USPTR, USPTA, United States Tennis Academy, Tennis Canada and other national federations. Players are able to register for 12 months or take part in seasonal sessions. For long term goal oriented players we offer the Elite Junior Tennis Academy. Along the most comprehensive facilities and coaching staff in the Greater Toronto Area, including health and fitness facilities we are located in Richmond Hill only 30 minutes from most locales in the GTA. We also offer Adult Tennis Programs, which are open to players of all ages and abilities. New players may begin with a Program Membership but then discover the benefits and program rewards associated with one of our other memberships. Players are able to supplement their group program with individual private tennis lessons and a wider range of tennis programs including regular scheduled Group Play, Leagues and Special Events. Take a moment to review our Summer Tennis Academy and Camps. 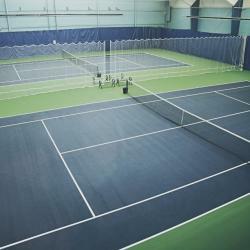 Our facilities include 9 indoor tennis courts, 11 clay courts, 5 floodlit outdoor tennis courts and a modern fitness floor. Tennis at the Richmond Hill Country has never been in better shape. Players are placed according to their age, experience and ability. The Club reserves the right to change placements based on ongoing recommendations of the coaching staff. The club also reserves the right to make changes to class times and player groups to accommodate a group learning environment. As an option players may apply to join the Elite Junior Tennis Academy and receive all the associated membership privileges with the academy if enrolled for a 12 month period into Tier II, III, IV or V Tennis Competitive. This academy will engage it’s participants to discover the worth of high performance character development to become a “Best Competitor”.